Fencing in. Fencing out. Fencing. Fencing systems are an integral part of any tennis court and it's environment. The primary purpose of your fencing system is to keep the tennis balls contained within the court. However, security is another factor when it comes to choosing a fencing system. One of the unique qualities we offer is the exploration of several different fencing designs and solutions: from mesh, to wire, to wood, and more. We also offer windscreens to block the wind and add privacy. 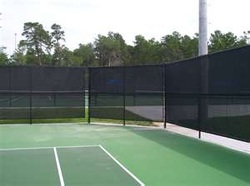 The area that you wish to screen is measured and the windscreens are made custom for your tennis court.